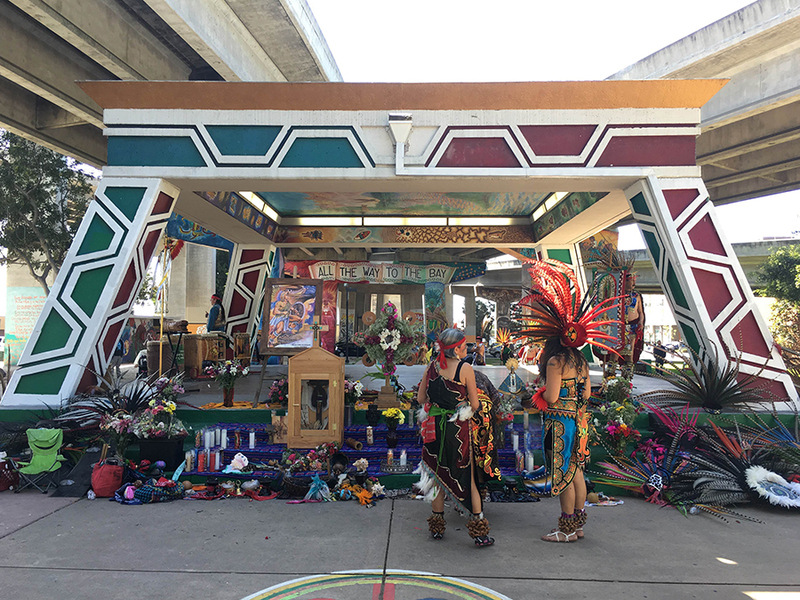 A kiosk in Chicano Park, Barrio Logan after danzantes performed and left offerings. In early October, Jenny Niezgoda, a white travel blogger better known as The Barefoot Bohemian on Instagram, released a Kickstarter and video stating her mission for a “modern frutería” in historic Barrio Logan. Her video went viral in a matter of hours. 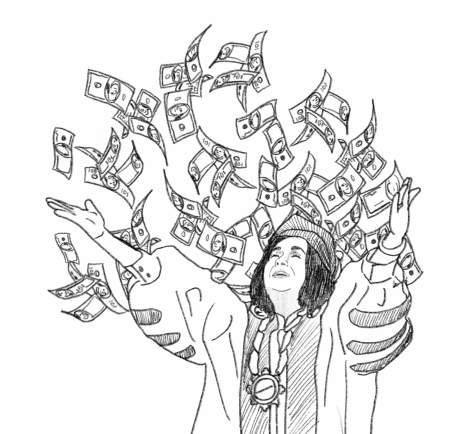 However the virality was not in her favor. Within 48 hours, her Kickstarter was cancelled, but the video is still being viewed. “It was jaw dropping because of the way (the video) was portrayed — sunshines and rainbows from the woman who was trying to build her frutería,” said sociology senior David Santos. Barrio Logan has a long history of grassroots activism and fights against gentrification. Gentrification is altering urban neighborhoods for the profit of the upper or middle class, which often results in putting small businesses in jeopardy. La Gracia Frutería is a perfect example of what’s occurring in low-income communities of color throughout San Diego and the U.S.
One of the main issues with people like Niezgoda coming to communities like Barrio Logan for business is that she is pushing out the opportunities for community members to create their own businesses. She is seeking profit and expecting the community to pay her for their culture. Some feel that people like her opening businesses in barrios are making it hard for Chicanos to financially prosper. “When we try to start a business, we may not always have the resources or the support, so seeing her trying to make money off what we usually do and doing it so easily is angering,” said public administration sophomore Eduardo Santiago. Niezgoda was able to easily start a project while street vendors constantly struggle. “There’s people who get in trouble for selling fruit on the street and in their carts and they are just trying to make money to feed their kids,” said social work junior Amaris Tenorio. Aside from the tacky guitar music and her vapid tone, Niezgoda’s language in the video is problematic, and a textbook example of “the white savior” coming into a community of color. In the video she calls Barrio Logan an “up and coming neighborhood,” which is another way of saying it is appealing to the middle and upper class. Although new businesses can improve the look of the community, they would do the opposite for the living conditions of current residents. If housing prices go up, many of the working families will need to leave the place they’ve lived for generations. Many people expressed similar opinions online. Niezgoda took notice of the reactions and handled the situation poorly. The now deleted frutería Instagram page previously disabled comments on photos and Niezgoda’s personal account was made private. If she really appreciated the culture like she said in her video, she should have given people the chance to voice their concerns to her on social media, so she could learn and understand why people were upset. Santos felt proud of the community’s quick action when they saw something threatening the barrio. “This is another example of why Barrio Logan has the history it has, in times like this people come together and say what they have to say. I give them props for that,” he said. However, gentrification is still a problem. People continue to invade communities of color with negative consequences are intended or not. Rather than purchase a “Mexican” meal from Chipotle or other corporate chains, going to the family owned restaurants in Barrio Logan can ensure that money is directly going to the people whose culture one is consuming. The best ways to prevent communities from being displaced are by financially supporting small businesses, calling out those like Niezgoda who are ignorantly gentrifying neighborhoods and becoming educated on the systematic oppressions of communities of color.